Above: Photo via Robert VanMeter III. For way-off-Island folks. This weekend's fire was quite a spectacle. Below is an early write-up. As of this blog typing (9 pm), thing have seemingly settled down in the Pinelands, though situation-aggravating west winds to 24 mph have kicked in. Working Wildfire Involves 10,000 Acres of Core Pinelands. A forest fire of unknown origin has become one of the state’s largest wildfires in over a decade, consuming over between 8,000 and 10,000 acres, much of it within Penn State Forest. It is being called Spring Hill Fire and was first reported around 1:45 p.m. Saturday, according to Lawrence Hajna, spokesman for the N.J. Department of Environmental Protection. According to authorities, south winds gusting to over 25 mph quickly spread the blaze from its point of origin. The fire also comes during a seasonally high wildfire danger point. Springtime offers readily available fuel from still dormant and overwintering foliage. By late Saturday, heavy smoke and flames to over 30 feet in height led to the closing of a heavily used section of Route 72 in Burlington and Ocean counties, between routes 532 and 539. The roadway remained closed as of midday Sunday but was declared open by about 4 p.m.
As of noon, the wildfire was over 75 percent contained, as more than 50 Forest Fire Service firefighters began getting the upper hand, helped by rain showers associated with a cold front. However, the fire had not been declared as under control, per John Rieth, an assistant warden with the New Jersey Forest Fire Service. A wildfire is not considered fully contained until there is no chance of it further spreading. An expected wind shift by this evening could usher in west winds between 25 and 35 mph, possibly fanning any remaining hotspots, something the forest fire service will be monitoring. Along with closing roads in the area of the fire, communities as far away as North Jersey and New York were alarmed by the smell of the wildfire and began alerting local fire companies. According to a National Weather Service Mount Holly tweet, the far-ranging smoke was due to atmospheric conditions that held the smoke close to the ground level. No injuries have been reported, though respiratory difficulties were reported by some residents close to the blaze. Non-mandatory evacuations were made by some residents near Chatsworth. No homes have been damaged or destroyed, according to the NJDEP. Authorities have already begun investigating the cause of the fire, focusing on the apparent point of origin in the Spring Hills Plains pygmy pines area of Burlington County. Wildfires can burn hot and cold – to some degree. This latest blaze was on the scalding hot side. If you recall the Warren Grove blaze, it was a tree-top runner, so speedy it burnt relatively cool. This weekend's Spring Hill Plains fire was low, somewhat slow ... and a bruiser, as indicated by its intense smoke and the bizarre sky-glow that could be seen after dark from the top of the LBI Causeway bridge. It was also forgiving, missing built-upon areas,which would have been in hot water, so to speak. Per the National Weather Service, a form of atmospheric inversion literally pressed down on the blaze from above. This made it burn from ground to tree tops, with flames reaching over 30 feet in height. This was also a potential killer fire. Forest fire fighters, between 50 and 60 in number, knew this all-too-real danger and managed to fight the raging fire with no one being injured … or worse. They didn’t do an amazing job ... they did an utterly astounding job! As to the ecological losses, they could have been astronomically worse … in just a few weeks. Hibernating wildlife, i.e. the majority of Pinelands creatures, are still below ground – hopefully deep enough to have weathered the inferno passing over. 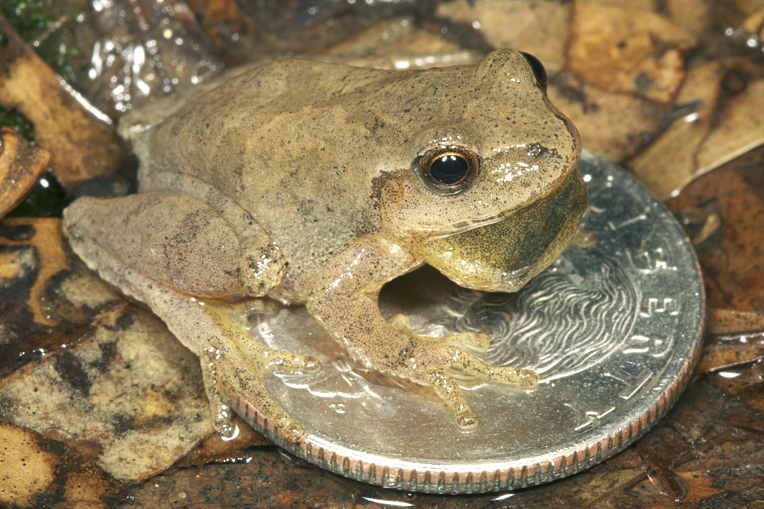 As to the early-out frogs, most notably spring peepers and wood frog, they’re ponded; dedicated to hanging in watery areas. This should have sheltered them from the heat. My main concern is for box turtles, also early risers come to climbing out with the first signs of spring. They’re far from speedy when it come to outpacing advancing flames. Here’s hoping their shells did their protective duties. Once the all-clear is given, I’ll be exploring some of the burnt-out zones. That will offer a better insight into how wildlife fared. As is always duly noted with wildfires, they are an instrumental part of the Pinelands ecosystem. They are needed to perpetuate scrub pines, which use the flames to launch seeds. The fire also tends to keep invasive species – and even larger species of pine trees – from taking over. Despite the eco-essentialness of fire, the collateral damage can be extreme. Again, had this major fire hit next month, it would have been eco doom.